Ms. Brings Plenty was included on this list as “another inspiring leader at Standing Rock…, who helped create and sustain the Two Spirit Camp,” as noted by COLORLINES. “It is an honor to be recognized amongst other national leaders, who never backed down and stood strong in the face of the many obstacles it took to impact their nations,” told Ms. Brings Plenty. 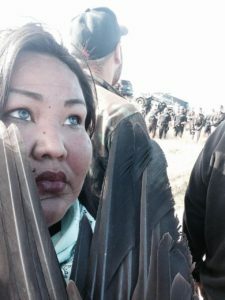 “I am leading the Two-Spirit Nation at the Oćeti Śakowin, the prayerful resistant camp against the Dakota Access Pipeline, not only to protect our sacred waters, but to also reclaim our roles as Two Spirit Warriors. Also included in the list of 16 Women of Color Who Made History in 2016 is the enrolled member of the Standing Rock Sioux and the former tribal historian, LaDonna Brave Bull Allard. “LaDonna Brave Bull Allard…owns the land that Sacred Stone Camp rests on, one of the water protectors’ largest encampments. Allard’s family has been in North Dakota since the 1800s, and she’s been a driving force in the Standing Rock campaign. ‘I come from a long line of bigmouthed women,’ she says. ‘My grandma, my mom—they always stood up,’” as reported by Jezebel. Published by Race Forward, COLORLINES is a daily news site where race matters, featuring award-winning investigative reporting and news analysis.